I had the good fortune to attend the Diamond Celebration kickoff and was able to speak with celebrities, Disney honchos, veteran Imagineers, and others about the beloved park and the man who first conjured the magic, Walt Disney. What follows are quips, quotes, reflections, and other thoughts about what Disneyland and Walt means to some fascinating folks. Let's start with Neil Patrick Harris. The multi-hyphenate star of stage, screen, and television really needs no introduction. He is a huge Disney parks fan (and fan of theme parks in general), is a perennial host of the Candlelight Processional at Epcot, and is the voice riders hear just before the launch of the California Screamin' coaster at Disney California Adventure. 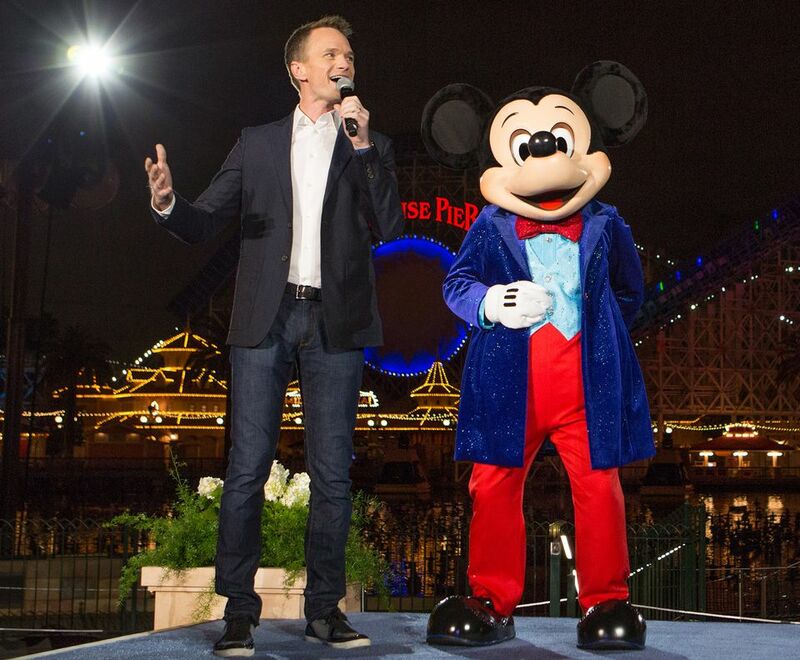 Harris' presence at the parks got a whole lot bigger (figuratively and literally) when he became the co-host of World of Color - Celebrate, the updated nighttime spectacular. "Walt Disney was my idol growing up. I think it's unbelievable how he committed his life to the complete amusement and enjoyment of others. He was really dedicated to that as an idea, and dedicated to Disneyland as an idea. To be turned down as many times as he was to get the money to fund Disneyland initially and then to have the drive to keep trying because he knew that it would succeed -- I like that gumption. Ride for ride, what he's created has had such a lasting effect on people. I think Disneyland is an important place for families, couples -- whomever -- to come together and get to experience it. It's a benchmark for creativity, ingenuity, intelligence, and exuberance. Now that I'm a parent, I'm much more aware of why things are impressive to kids. It's easy to feed [my young children] short-attention-span visuals. But there's something great about the pace of the Disneyland adventures that I think allows them to retain them longer. Pirates of the Caribbean doesn't have to be a roller coaster to be unbelievable. Among my favorite attractions is Haunted Mansion. I collect memorabilia from it. I love the new Hatbox Ghost! I giggled like my children when I saw it. I also love Pirates of the Caribbean. I think it holds up so well. Radiator Springs Racers is fantastic. There's a lot to love here." Bon Gurr worked alongside Walt Disney and was one of the original Imagineers who helped design Disneyland. At the time I wrote this, he was one of three people still alive from the pioneering team. Gurr had a hand in developing virtually every vehicle at Disneyland, from the gondolas on Peter Pan's Flight to the monorail trains, during the park's first couple of decades. "In the 1950s, [Walt Disney] collected 18 people from outside and within the studio to design Disneyland, one of whom was me. I have a unique perspective on Imagineering, which started as WED Enterprises. I came in 1954 and hopped aboard the high-speed train. Walt had a great sense about people who were doing one thing, but might excel at something else. He asked a lot of people, including me, to do things that they never did. I was trained as a car designer in Detroit. I wasn't an engineer. Walt figured if I could design the Autopia car bodies, I could do the whole damn thing. I couldn't, but I kept my mouth shut. I read up and learned very quickly about the things I needed to get the job done. I was a tinkerer, and I knew how cars worked. I'll tell you why Walt Disney was so successful. His most important attribute was curiosity. He was endlessly curious, and he surrounded himself with curious people. He wouldn't give up until everything was right. His work habits and ethics were infectious to the people around him. If they weren't intent on doing things well, they weren't around for long. Sure it took extra work. But Walt had a sense that people would always recognize when something was good." While he wasn't there at the very beginning of Disneyland, Marty Sklar did work alongside Walt in the park's early years. During his more than 50 years at the Disney company, Sklar held various positions including vice chairman and principal creative executive of Walt Disney Imagineering. Now retired, he serves as Imagineering’s international ambassador. Speaking of stories, the Haunted Mansion initially lacked one as Walt and his design team struggled to develop the attraction. "There was a sign I created in 1963 that eventually keyed the whole thing," Sklar explains. After Walt came back from a trip to London, Sklar asked him what he was doing overseas. "He said that he was searching old mansions and manor houses for ghosts that didn't want to retire." Even though there was no consensus about the attraction, Walt went ahead and had the exterior of Disneyland's Haunted Mansion built in 1962. Inspired by Walt, Sklar created a large help wanted sign inviting ghosts that wanted to continue practicing their trade in active retirement at the mansion to send their resumes to the "Ghost Relations Dept." The sign hung for many years in front of the empty building. "When (Imagineer) X. Atencio started working on the project," Sklar says, "the sign became the thread of the Haunted Mansion." Until he was promoted to the position of chief operating officer of The Walt Disney Company earlier in 2015, Thomas O. Staggs was the chairman of Walt Disney Parks & Resorts and oversaw all of the properties around the world. He is widely viewed as the successor to Robert A. Iger, the company's chairman and chief executive officer. "I didn't get to come to Disneyland when I was a kid. We couldn't afford to make the trip. My first Disney park visit was 1989. I joined the company in 1990. It didn't take me long to figure it out! But I do have memories of watching [the television show] 'The Wonderful World of Color' on Sundays and getting glimpses of the park as I was growing up. It was aspirational. You didn't have to visit the park to have a Disneyland memory." "I have a lot of Disneyland memories, because I've been coming here since I was two years old. Not that long ago, something special happened. My mother is Madame Leota in the crystal ball, and she's also the little Leota at the end of the ride. That's her voice. I used to bring my kids here often when they were little, and my mom passed away when they were 5 and 10. One day we were going up the ramp [at the Haunted Mansion] and I said to the girls, 'Wave to Grandma. There she is.' And I heard the lady behind me say, 'What a weirdo!' to her kids. My 10-year-old still teases me about that. I'm actually very proud that my mom is Leota." The founder and former chief archivist at the Walt Disney Archives, Dave Smith is now retired. Growing up in Southern California, Smith wasn't at Disneyland on opening day, but he was there a year later in 1956. ("My parents wanted to wait for the crowds to subside," he says.) He was fifteen-years-old and had won a Disneyland passport, which gave him free rein of the park, as part of a newspaper delivery contest. At the time, guests had to purchase tickets to board the attractions. "This was before I had my license, so I went straight to the Autopia. In those days, there were no side rails, so it was more like driving a real car," he says. While walking around, Smith recognized Walt Disney wandering the park. "I wanted an autograph, but realized I didn't have anything to write with, so I went to the Magic Shop and bought a two-foot long gag pencil. Walt politely explained that he couldn't give me an autograph, because everybody would ask for one. He told me to write him at the studio instead," Smith recalls. "I did, and he did send me his autograph. I still have it." Mary is the vice president of Disneyland Park and is responsible for the day-to-day operations of the park. "I was 12 when I first came to visit Disneyland. My family couldn't afford to come [more often]. We lived in central California. We stayed in the trailer park across from the park. They had the ticket books at that time. We were here for two days. Disneyland, even then, had too much to see and do in one day. My youngest sister was five, and I convinced her that the "E" ticket was not as good as the "A" ticket. I'm not very proud of that, but that's something our family talks about to this day. She was too small to go on the "E" ticket rides anyways, but at the time I told her that for all of the wrong reasons." Because her church youth group was invited to the opening day ceremonies, Bonnie Williams was among the first children to cross the drawbridge into Fantasyland and ride Disneyland's rides. She was nine years old at the time. "I remember seeing Walt," she says. "He looked like a giant. I told him, 'I saw you on TV!' The whole day was magical. I felt like a real princess." Williams says that her favorite rides on opening day were Peter Pan and Dumbo. To this day, I ride them. I continue to love Disneyland. A special piece of my heart is here." "When I started on Disneyland, my wife used to say, 'But why do you want to build an amusement park? They're so dirty.' I told her that was just the point--mine wouldn't be. Disneyland would be a world of Americans, past and present, seen through the eyes of my imagination--a place of warmth and nostalgia, of illusion and color and delight." Disneyland is like Alice stepping through the Looking Glass; to step through the portals of Disneyland will be like entering another world. I just want to leave you with this thought, that it's just been sort of a dress rehearsal, and we're just getting started. So if any of you start resting on your laurels, I mean just forget it, because...we are just getting started.